NSW government’s consistent and rigorous efforts have educated people about the harmful effects of asbestos. 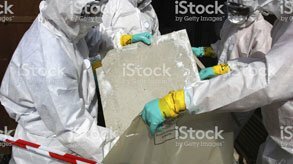 However, we at Breath Easy Asbestos Removal, a highly skilled asbestos removal west Sydney company have found that most people do not know why and when it is harmful. Our experts, therefore, thought of educating concerned people about this material through this blog. Asbestosis: an inflammatory condition of lungs that can make it hard for the patient to breath normally. Lung problems such as abnormal fluid accumulation in the chest wall, thickening of the membranes of the lungs, etc. Asbestos fibres enter your body mostly through inhalation. However, not every exposure is risky. The fibres are present in our atmosphere all the time and we all inhale some quantity of them with every breath. This means, we all are exposed to small about of asbestos on a regular basis. Thankfully, minute exposure is not harmful. How much a person is exposed to this mineral? How long he was exposed to? His overall health, including the presence of other respiratory problems and conditions. Smoking is another factor that can make you more prone to asbestos related problems. Even if you are living or working at a place that is made of this fibrous product, you don’t have to worry. It is now scientifically proven that asbestos is safe for use if it is in an undisturbed condition. The fibres are usually firmly bound to cement that prevents them from being exposed to the air. However, if the cementing layer is disturbed or destroyed, you have all reasons to worry. Being a responsible asbestos removal west Sydney company, we strongly suggest you to get your home or office evaluated to find out the condition of this material in order to ensure your safety and well being. Asbestos inspection is our specialisation. We will also test the sample at a NATA accredited laboratory to determine the presence of this mineral at your home or workplace. We will thoroughly inspect the condition of the asbestos containing materials and will suggest you what best can be done. If asbestos fibres are exposed, removal is the only option. As per NSW government guidelines, if the contaminated area is larger than 10 square metres, you have to hire a licensed asbestos removal west Sydney company. However, we strongly suggest you that you must hire only experts like us, no matter how big or small the contaminated area is. We hope this blog educates you about this mysteriously harmful mineral. For more such helpful and informative details, keep reading our blog. To get your property inspected for asbestos, get in touch with us at 02 8093 5461.